For my Epic Fantasy Twelve Days of Christmas, I’ve been posting at noon every day. But today, due to circumstances beyond my control, I’m a teensy bit tardy. Last night I attended a paper lantern launching to welcome in the New Year, but as everyone’s paper lanterns soared slowly into the air, my lantern’s candle burned up and dropped into the snow before my lantern ever took to the air. Then, upon returning home, my internet promptly died and wasn’t fixed until recently this afternoon. I’m not superstitious in the least, but I do hope this isn’t some sort of sign that I’m in for a rough year. Looking a little like drifting paper lanterns themselves, from a distance, for “Nine Ladies Dancing” I’ve done nine little fairies enjoying some festivities with a dance procession. And yes, there are nine visible little poses, each with her own individual style of dress and hair, though you can’t quite see them all from this size. 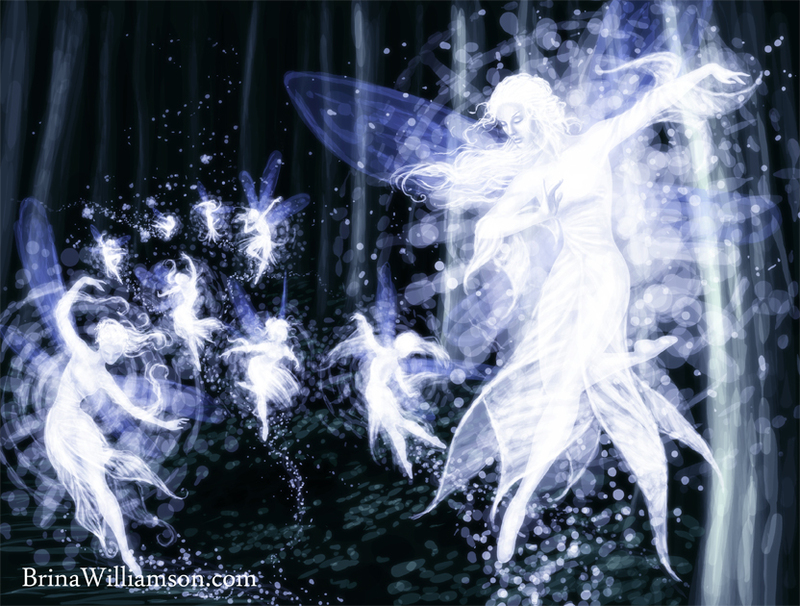 I thought fairies seemed like the obvious choice for this particular picture, and had a lot of fun coming up with the poses.